Note: There is masking on the front of the sheet to protect it – this should be carefully pulled downwards and removed when the job is complete. 1. Check all walls to be clad, make sure they are dry and free from oil/grease. 2. New walls and plasterwork should be cleaned down with a sweeping brush, and a coat of PVA applied (mix one part PVA to four parts water). This can be applied with a roller or paint brush. 3. If the back of the sheet needs to be cleaned, use only recommended Geocel products. Never clean the sheet with harsh liquids or chemicals. 4. The bottom (heavy) J-trim can be bonded and sealed to the wall (a fixing can also be used to secure the trim). The position for the J-trim is usually 100mm from the bottom of the trim to the finished floor level, to allow for the flooring detail. 5. 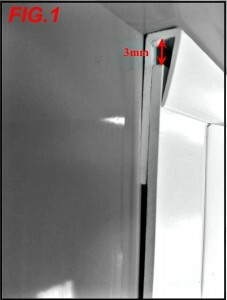 To cut the sheets to the correct height, measure vertically from the bottom of the trim to the ceiling and deduct 3mm for expansion of the PVC sheet (Fig 1). 6. Peel back some of the masking at the top of the sheet and cut the top (light) J-trim to size (1230mm will allow for 5mm extra each side of the sheet), then clip it on to the top of the sheet. 7. Cut the nozzle of the Geocel 796 adhesive to achieve a 6mm bead when applied to the sheet. 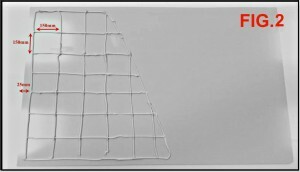 The adhesive should be applied to the back of the sheet (the side without masking) in a grid pattern of approx. 150mm squares (Fig 2). In some cases more adhesive may be required, for a fully bonded system use Enviroclad solvent-free grab adhesive and apply with a 6mm notched trowel. 8. Lift the sheet into the bottom J-trim, press against the wall and smooth it out with your hands until the sheet has fully gripped. 9. At the edge of the sheet, carefully peel back some of the masking tape. Cut the back part of the 2-part joiner trim to correct height by measuring from the ceiling to the bottom of the heavy J-trim. Deduct 60mm from the measurement and cut to size. 10. With the back of the joiner trim in place, fit the second sheet and bond to the wall. 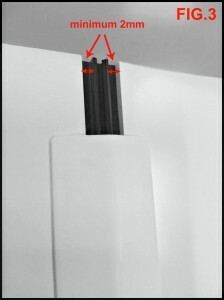 Make sure there is a 2-3mm gap each side of the backing trim to allow for expansion of the PVC sheet (Fig 3). 11. Fit the front cover of the joiner trim after each sheet by tapping into position with a mallet. For a watertight seal, Geocel 799 silicone can be applied before the cap is fitted. DO NOT wait until the job is finished to fit the front cover as the adhesive may set and make the fitting more difficult. 12. Enviroclad installers use thermoforming machines to fold the PVC on site for corners. As an alternative you may wish to use internal/external PVC angle trims bonded in place using the same Geocel 796 adhesive. Make sure to use masking tape to secure the angle in place while the adhesive sets. 13. Before fully removing the masking from the sheets, use a cloth or roller to brush them out in order to expel any air that may have been trapped. Use Geocel 799 silicone to seal around trims etc. There should be no gaps left in the system when fitted correctly. Note: The steps above are guidelines only based on past tests and installations. Please adjust for exceptional circumstances where the substrate is contaminated, there is excessive moisture in the air or extremely hot/cold conditions. Enviroclad sheets should not reach or be exposed to temperatures exceeding 55 degrees Celsius at any time.